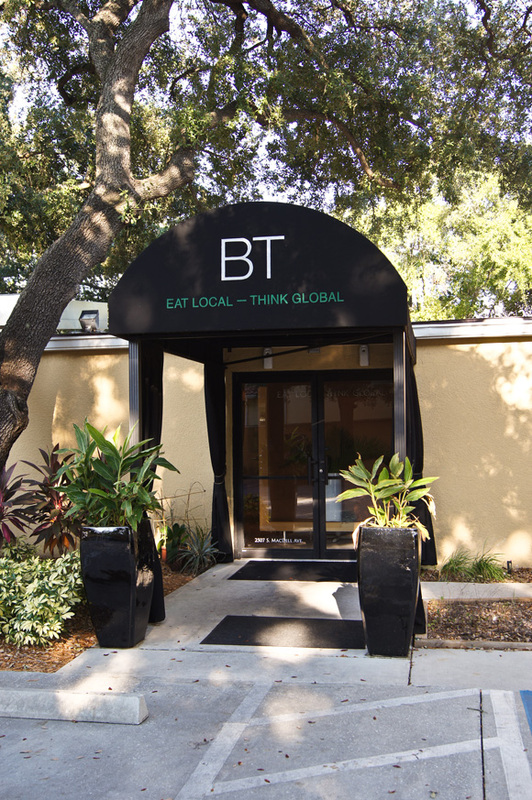 A couple of weeks ago, I was contacted by Gina Melton of Zest in order to extend an invitation to a Holiday Party sponsored by Bard Valley Natural Delights and taking place in one of the most popular spots in South Tampa right now, Pane Rustica. I did not have to be asked twice, I accepted so fast, I think I did not give her a chance to say another word. My first impression of Pane Rustica was that it was cozy and was bigger than I had imagined. They are known for Contemporary American style cuisine and are very popular with the lunch crowd. At night it elevates its casual lunch atmosphere for fine dining and a great wine selection along with a hopping full bar. The hosted walked me to a private dining room, where I started to mingle with my fellow bloggers who I have met before and some who I was looking forward to meeting for the first time. Isabel from Family Foodie, Cara and Megan from Healthy Tampa Bay Living, Mr. Jeff Houck from TBO’s The Stew (love this guy! ), Tracy from My Other City by the Bay, Elizabeth from Food Nation Radio Network, Nina From Panache Vue magazine, Jim from Gastroblog and Jodi from HashtagFoodPorn. This was a serious crowd and I was delighted to share a Wednesday night in their company. A couple of weeks ago, a fellow Tampa Blogger, Leslie from The Hungry Housewife posted on facebook an upcoming Foodie Feed Up event in Tampa. NESCAFÉ Dolce Gusto was hosting 8 Foodie Feed Ups around the country for bloggers to check out some of their local chefs’ favorite dishes and also try their yummy new coffee line and they were coming to Tampa. They’ve already hit up Cleveland and New York City; by the time they came to Tampa and next up, they were headed to Chicago, Seattle, Houston, LA and Denver. Five fellow bloggers along with myself jumped at the chance to experience this affair at Restaurant BT on a quiet Monday night. Food Blog Forum Atlanta – Take two! After 2 days of basically living with my Kleenex box clutched to myself and glasses upon glasses of liquid and very good, knock you out, cold medicine - I’m out of bed. I still do not feel 100%, but there is so much sleeping and bad TV I can take – Bravo I’m looking at you, no more Housewives nonsense and shame on you for getting me hooked to Rachel Zoe. When I stared to write about the Food Blog Forum Conference, I thought of giving you a long longer post about everything that happen in Atlanta, but with over 100 bloggers in attendance, I’m sure most have already seen plenty of recaps about how much fun we had, how much information we got from all of the great speakers, the amazing food we all ate (I’m so craving those pork belly tacos from chef Kevin Rathbun, which I’m totally going to duplicate) and the great goodies in our swag bags, which I had to ship separately because there was no way I could come up with an valuable explanation for the knife at ATL airport. I don't have a recipe this week, mainly because I was eating my way throughout New York City for the past 4 days. Last Thursday I took off to brave freezing temperatures in order to celebrate my best friends 40th birthday in New York City. Boy did we celebrate! Here is a quick run down of the foods, places and our take on our culinary walk-about. We started Thursday nigh by visiting Mama Mexico. A family owned restaurant close to where my NY friends live. While the food was fresh and flavors were spot on. The best things were the "Margaritas". We ordered the guacamole, which was done tableside, unfortunately the place was super dark and pictures did not come out. I ordered their appetizer, "Almejas al Tequila", which are clams, filled with baby shrimp and crab with a tomatoes, tequila, cilantro and olives all sautéed on top. It was refreshing, fresh and delicious. Another way to go is the traditional Burritos and Enchiladas, which were also a hit. On Friday night we took the birthday girl to Fig and Olive. Located in the meatpacking district, this is a happening place. The atmosphere was full of a trendy vibe, beautiful people and eighties music, who knew? The bar was hopping while people were waiting for their table. It was the perfect place for a birthday dinner. As the name suggests, many recipes feature liberal use of olives, olive oil, and sweet figs, all of superior variety and quality. We started with a couple of appetizers but the star of the show was the "Fig Gorgonzola Tartlet". The melted gorgonzola, prosciutto, fig, walnuts, arugula, tomato on top of a puff pastry was such a hit that we all pretty much were licking our fingers and eyeing the last piece - ready to pounce. Another good choice was the "Veal Carpaccio", and the "French Riviera Rotisserie Chicken". On Saturday night we had tickets to see a show in Union Square, so we decided that Republic was the best choice, plus we all were craving Asian food. We started with the "Fried Calamari" and the "Fried Wontons" as appetizers, and we were not disappointed. The sweet-chili sauce of the Calamari was to die-for. I ordered the "Wonton Broth Noodles" while my friends opted for the "Chicken Pad Thai". We also highly recommend the red "Sangria". After the show we decided the only thing to do was to duck into the "W" hotel to warm ourselves down and to have a couple of drinks at the Living Room Lounge. We were all over the drink menu and ended up ordering a couple of appetizers to make sure the hang-over the next day would not kill us. It's all about balance people - trust me. We ended up loving the "Fig and Prosciutto Flatbred" (Yummy) and the risotto tater-tots filled with Asiago cheese. (I'm so going to duplicate this, make sure to look for it in a future post). To round the whole culinary experience we had going, on Sunday we decided to head back to the meatpacking district/Soho and find our way into Pastis. The restaurant looks and feels like an early 20th century French bistro - without being tacky. Broken mirrors on the wall are offset by stained and cracked tiling and worn floorboards. Nicotine-stained ceilings are nicely ironic in a city where you can't smoke in public. It was the perfect place for a late, very late brunch. More than once we keep saying "Are we in back in Paris or in NYC?” This place its happening right now, the wait was around 15-20 minutes and it was almost 4 in the afternoon - The place was packed! The food was excellent. I ordered the "Eggs Florentine" and the Béchamel sauce combination with the poached egg on top of sautéed Spinach was the perfect comfort food after a night of drinks. The other dishes to recommend here is the fries and the "Croque-Madame". Its also the perfect place to find someone famous. We sat a table away from Matt Dillon and his companion. Very cool. And of course since it was a Birthday celebration we could not forget the most important thing. The Cake. And were else but Magnolia Bakery? The only flavor acceptable was the Coconut Cake and it was so good we ended up eating it every day during our trip.